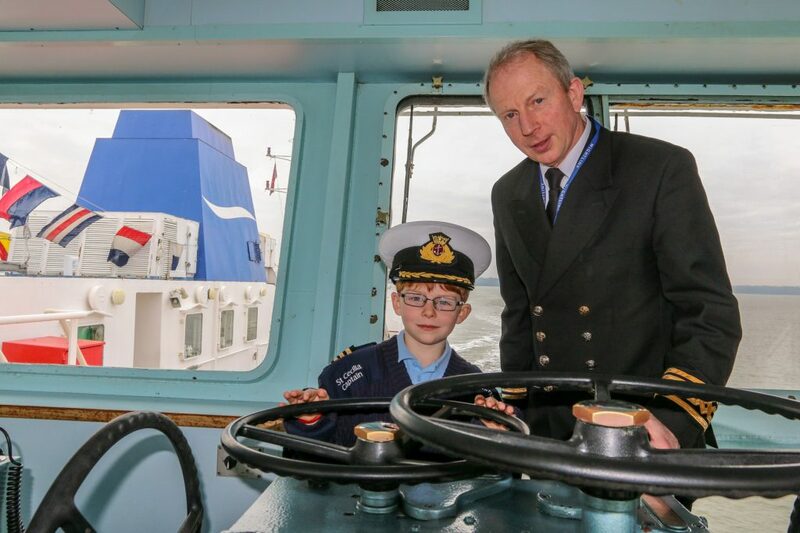 Eight year old Ellis Yeats was VIP for the day when Wightlink’s oldest ship St Cecilia sailed across the Solent for the last time on Friday 25 January. The youngster from Gosport is Wightlink’s greatest fan. He lives life to the full despite undergoing several operations for the brain condition – Chiari malformation. While he enjoys watching all the ships pass through Portsmouth Harbour with his Mum, Emily, his favourite is St Cecilia. When Wightlink decided it was time for the 32 year old ferry to retire from the fleet, thoughtful staff wanted to break the news gently and invited Ellis and Emily to join the celebrations for the last crossing. Sporting an authentic Captain’s hat and sweater donated by Wightlink, Ellis helped Captain Jim Blanch steer the ship, cut a celebratory cake and read out a poem he had written about St Cecilia. St Cecilia will soon join her sisters, the former St Catherine and St Helen, at the Italian ferry company Delcomar which connects Sardinia with two offshore islands.